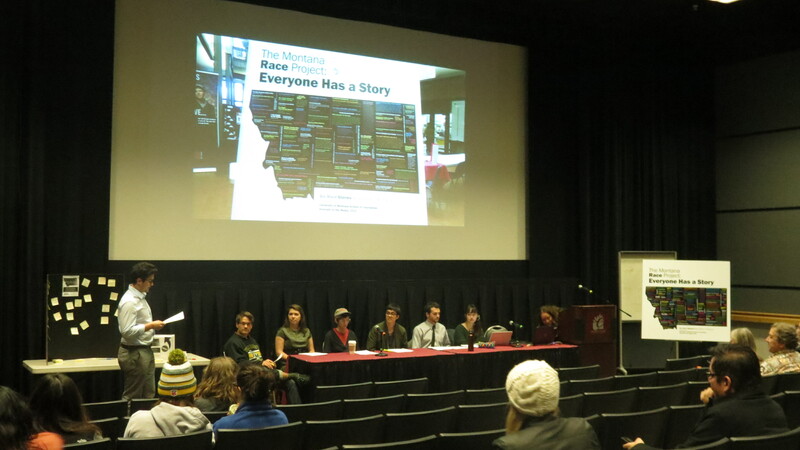 In the UC Ballroom on Thursday, November 5th, a group of seven students and their professor talked about what they’d learned over a semester spent exploring questions of race in Montana. The students have created the Montana Race Project, in which they drew in six-word essays from around the state that touched modern questions of race and diversity in Montana and beyond. Students took turns reading their favorite submissions from the project. Photo by Alyssa Rabil. The professor, Kathy Weber-Bates, is an adjunct instructor at the School of Journalism, and the project was created through her Diversity in the Media course. To introduce Thursday’s panel discussion, Weber-Bates talked about her frustration with the idea that it was difficult to talk about diversity in a state that was not that diverse in comparison to others. That idea, she said, is misleading. “It made an assumption that the state doesn’t have a multitude of voices,” and that’s not true, Weber-Bates said. For her and her students, a focus that arose over the course of the experience was on the importance of conversations about race and diversity even, or perhaps especially, in institutions or places that are predominantly white. The students on the panel said they were surprised by how often the sentiment that Montana didn’t have a race issue and had no need to discuss the subject seemed to come up. To uncover the real concerns about race in Montana, the class created an online form where anyone could submit a six-word essay, which they then promoted as a class via social media. By November 5th they had received over 300 essays from all over the state. Some stories showed ignorance, others hope and optimism and still others expressed challenges of self-identity in today’s world. All showed a state where questions of race are very much alive. Five of the students on the panel study journalism. They’re certain this experience will help guide their future work in a profession based around the idea that telling stories, everyone’s stories, matters. “The stories that I choose to tell and how I choose to tell them can bring things to light or bury them,” said Mia Soza, who is co-news director at the student run radio station KBGA. Chloe Reynolds, another journalism student, said she learned the value of casting a wide net with her reporting, in order to find stories in unlikely places. “You don’t know somebody’s story unless you ask them,” she said. To read more about The Montana Race Project and submit your own six word story, you can visit their website or search for them on Facebook.